---TaKe ConTroL---: It's a blood thingy! My dad is easily the first person I'll go for for business advice. He left his home after his primary school education to pursue a living. After some years of hardwork (and serving his oga(s)), at his mid/late 20's he became a successful businessman. At his prime, he managed 7 shops spread across Lagos and 12 boys manning those shops, in a joint business between him and his elder brother. Things fell apart though, before we (his kids) could really feel his wealth :( Then he focused on ensuring that we all get educated. However, he always has one advice or another to give me in my quest to build a successful business. The picture above was his business promotional material from way back. I saw it among some of his stuffs one day and I took a shot. Here's to my dad, Mr John Ezeokoye -- M.D. 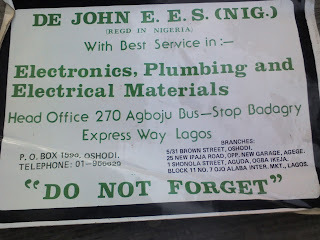 DE JOHN Electrical and Electronic Stores. 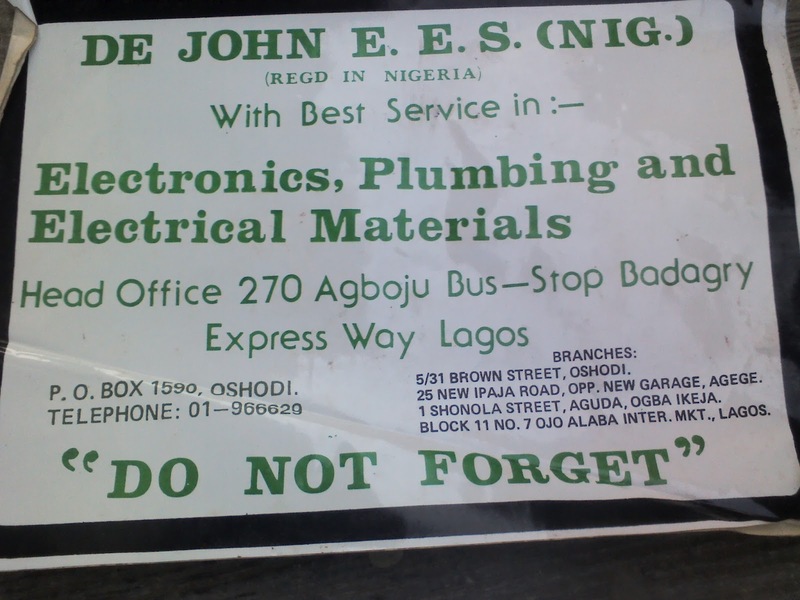 Dealers in electrical, electronics and plumbing materials.